Not all fun foods can be fun foods… that’s what I told my kids when they wanted homemade pizza and stove-top macaroni and cheese for dinner and cared less about the pan-seared broccoli I was making. Well, here I stand eating crow. 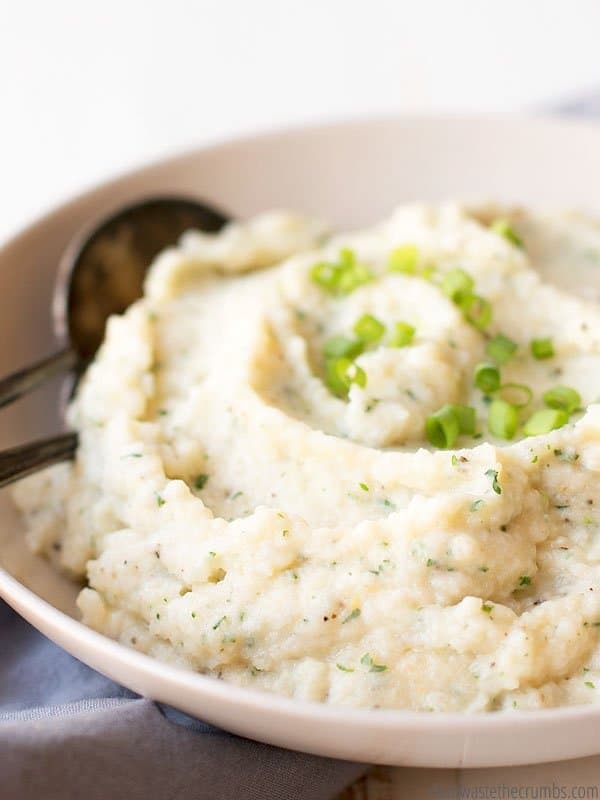 Because thanks to this rich and creamy mashed cauliflower recipe, I can boldly say I LOVE cauliflower! I learned how to make breakfast sausage and my kids ADORE it (which oddly, I’m making a double batch of tonight). My husband realized that he doesn’t handle dairy well (and possibly nightshades, although we’re still working on this). He and my daughter also learned to love avocado, so long as it’s in the form of avocado chocolate mousse (oddly again, also on tonight’s menu!). I also learned to love cauliflower. I have to admit, that while my crispy cauliflower rice recipe is good – especially when paired with sheet pan Hawaiian shrimp – it’s not my preferred side dish because… well, because it’s cauliflower. To throw another wrench into the mix, my husband has texture issues. He can’t eat ground meat, and he turns his nose up at any mashed anything – including mashed potatoes. What this generally means for me, is if I want to try a new side dish, I have to make a “tried and true” version as well, just in case he doesn’t like the new version. So the first night I made creamy mashed cauliflower, I also made roasted cauliflower. 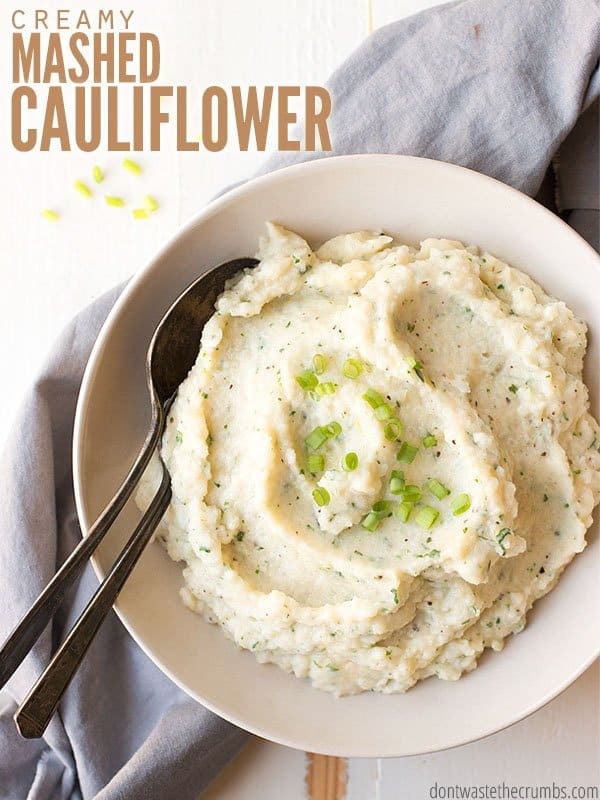 To be honest, I didn’t have high hopes that mashed cauliflower would go over well (because cauliflower) BUT I was tired of every other version of cauliflower we’ve had and I was desperately wanting a different texture on my plate. So I made them anyway and crossed my fingers. We’ve have mashed cauliflower at least once a week ever since – despite the fact that we’re no longer officially on the Whole30 – because they’re really that good. And, unlike a lot of Whole30 recipes, it’s SUPER fast. I’ve learned that cooking on the Whole30 isn’t hard, but it is time consuming. That’s why I recommend a big batch cooking session early in the week on my Whole30 meal plan. So to find a side dish that required minimal prep, minimal cooking and very little hands on – this was a breath of fresh air and a huge relief!! It’s easy to forget to add the garlic early on, but trust me here, don’t forget it. I did once and while the mashed cauliflower was still good, it lacked that punch that it had the first time. I realized my mistake later that night and I haven’t forgotten the garlic since, and never will again! Second, I laughed when the Whole30 book said that there was such a thing as a “coconut cream emergency” and recommended always keeping a can in the fridge. Then, when I realize I needed the cream from a can of coconut milk, I understood the emergency. You will need the cream and ONLY THE CREAM from one can of coconut milk. The best way to get this cream, is to put the can of coconut milk in the fridge when you get home from the store. Just keep it in there – it won’t go bad. This will cause the cream to rise to the top and solidify, making it MUCH easier to get to just the cream when you need it in a recipe… like this one! Be sure to put your canned coconut milk in the fridge for this recipe! Third, the best way to get to the solidified coconut milk is to open the can upside down. So if you put the can in the fridge right side up, turn it upside down, use a can opener and pour out the clear liquid. You should see the solidified coconut at the bottom of the can! When I was in middle school, it was “a thing” to get the chicken and mashed potatoes plate for hot lunch. I’d always dip my previously frozen chicken tenders into the instant mashed potatoes (covered with white packet gravy, I’m sure) and lick the bowl clean. 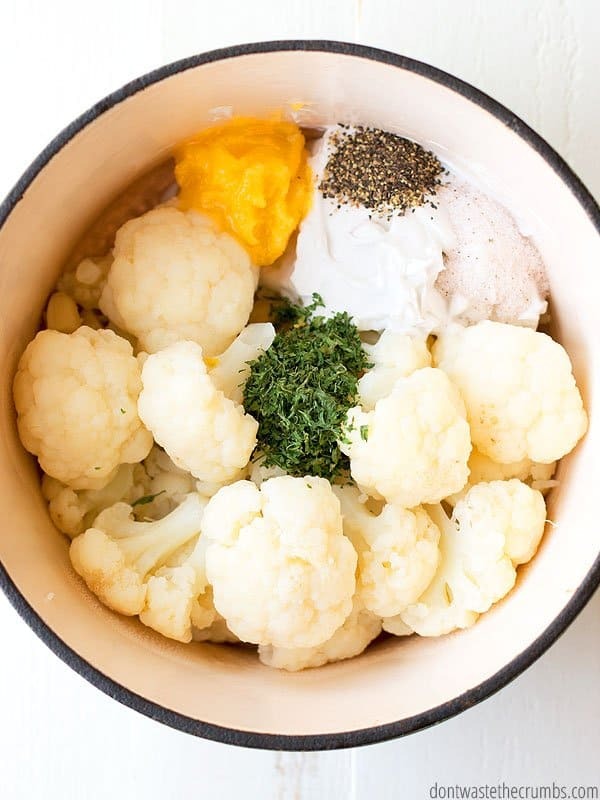 These creamy mashed cauliflowers remind me of those hot lunch days. If you need pairing ideas, I’d choose almond crusted baked chicken (if you’re on the Whole30), but cut into smaller chicken tender size pieces. If you’re not on any dietary restrictions, homemade chicken nuggets are THE BOMB and the perfect size for dipping into creamy cauliflower. 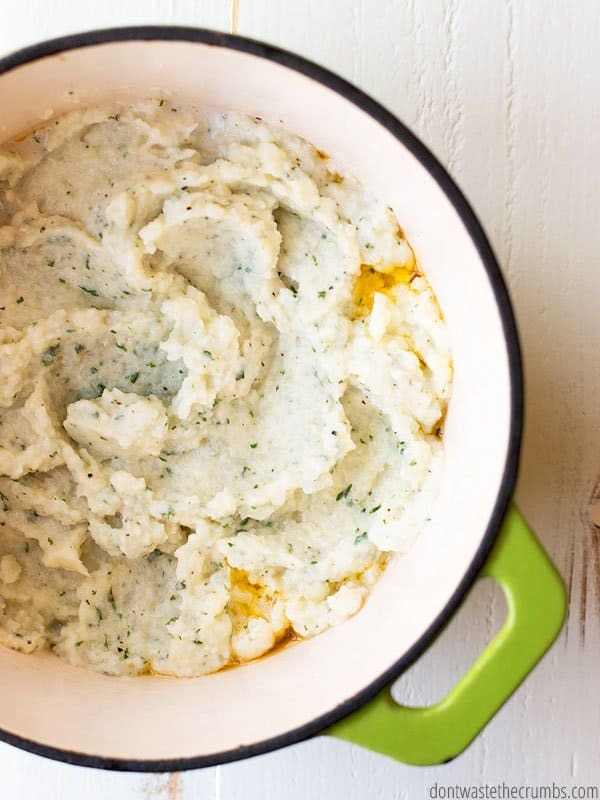 This side dish also reheats REALLY well, and can easily be made ahead of time too! I can’t reiterate enough the importance of choosing the right coconut milk. I have tried MANY brands and many variations, and it all boils down to the ingredient list. You want to see coconut (NOT coconut milk) and water. Guar gum is ok. Nothing else! I recommend this brand. Also, I used my immersion blender to mash the cauliflower in the same pot it cooks in… one less dirty dish! 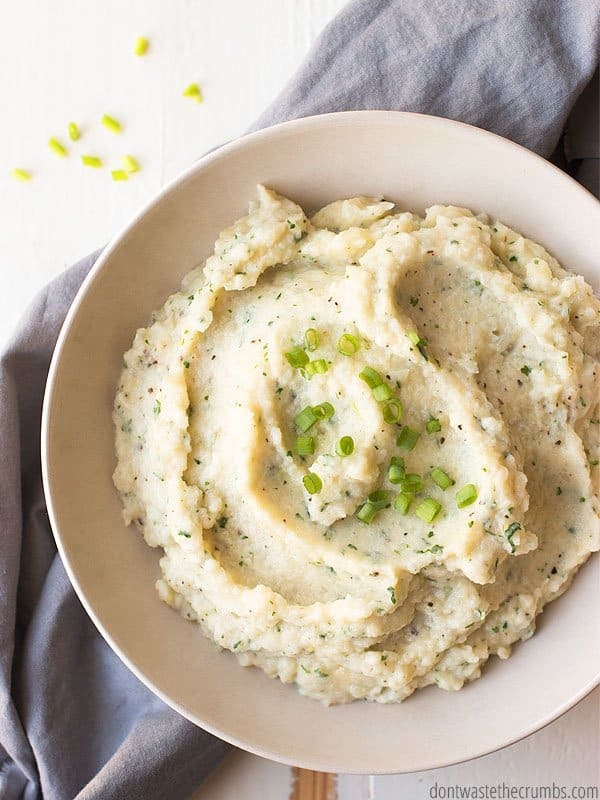 You can use a potato masher (for chunky-style), a food processor (I’ve heard great things about this one) or a blender (this is the one I have and LOVE). The immersion blender will give you the most control over the texture of your mashed cauliflower, but feel free to use what you have! Fill a large stock pot halfway with water and bring to a boil. Add cauliflower florets and garlic and boil until the cauliflower is fork-tender, about 10-15 min. Add additional water, if necessary, so the cauliflower is completely submerged. Pull the coconut milk from the refrigerator and turn it upside down. Use a can opener to open the can and pour out the clear water from the can. IMPORTANT: If your liquid is not clear, the coconut did not solidify properly. Either it wasn't refrigerated long enough, or your coconut milk didn't contain coconut, or you have a bad can (please see the post for additional information on this and the notes section to fix the recipe. In the same pot, melt the butter (or ghee) and the solid coconut milk with the salt, pepper and parsley. Add the drained cauliflower and garlic to the pot and using an immersion blender, pulse until it's reached your desired consistency. If your liquid was not clear when you drained your coconut milk, and it was white instead - or some clear with large milky white streaks - don't drain it. Mix the entire contents and measure out ½ cup. Add ¼ to step 5 and add additional liquid, as desired, to achieve the creaminess you want. Is there a vegetable that you couldn’t stand, but have since found a way to love? I’d love to hear your ideas and how you overcame being a vegetable hater! Please leave your recipe ideas and tricks in the comment section below! Looks yum-0! What do you do with the coconut water you pour off from the can? We haven’t been saving it, but it’s “coconut flavored water”… not sure if it has any nutrition, but as the temperatures get warmer, it would be good for making homemade ice pops and popsicles! Since it’s mostly water, it will be icey when it freezes (or will act like water in baking), so just keep that in mind. I’m so tempted to try this — but coconut milk? Sounds like this will taste more coconutty than mashed potatoey. ? Not at all – it’s SO good. Give it a shot!